Somali pirates have been paid more than $150m (£101m) in ransoms in the past 12 months, Kenya's foreign minister says. "That is why they are becoming more and more audacious in their activities," Moses Wetangula said, urging the world to take urgent action. He said it was affecting all countries involved in international trade. Ninety-five attacks have been recorded off the Somali coast this year, including the recent capture of a Saudi tanker carrying a $100m cargo of oil. 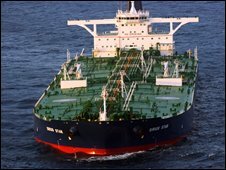 A reported ransom demand of $25m (£17m) for the MV Sirius Star was denied by the company conducting the negotiations with the pirates on behalf of the tanker owners. Shipping experts expect the demand to be much higher. The world needs to make it clear that 'crime doesn't pay' by bringing new leadership and stability to Somalia. A spokesman for the shipping industry in London, Pat Adamson, told the BBC there would be pressure from some quarters on the Saudis not to pay up as it would only lead to further hijackings. What was needed, he said, was for the navies in the area to go after the pirates' "mother ships" that were far out to sea, remove their armaments, and sink them. Otherwise, he said, it was only a matter of time before another super-tanker was hijacked. An Indian warship sank one "mother ship" this week. Mr Wetangula told a meeting of regional diplomats in the Kenyan capital, Nairobi, that piracy was getting worse. "Major trading countries - India, Malaysia, China - your vessels are in danger. Our major trading partners - Germany, Britain and others - our cargo is in danger," he said. "We must act now and not tomorrow." The United States says it is seeking clarification at the United Nations on how much force should be used to deal with the pirates threatening international shipping. Several navies have already engaged in battles against the pirates. The Indian navy said one of its frigates sank a pirate ship and British and Russian ships have exchanged fire with pirate vessels. "We're taking a look with other countries as to how we might modify that resolution to better enable responsible state naval assets to deal with the issue of piracy in the region, which has very real economic implications," US State Department spokesman Sean McCormack said. Meanwhile, the MV Sirius Star and its crew, which includes two Britons, are being held near the Somali port of Harardhere. The BBC's Frank Gardner says the 25-member crew are believed to be being well treated. He says negotiations between the pirates and the ship's Saudi owners are being conducted through an interpreter on a satellite phone using an outside company that specialises in dealing with kidnaps and ransom demands. Sailors seized by Somali pirates usually have to wait 45 days or more for the ships' owners to pay the ransom and win their release, he says. But sources in Harardhere say the pirates and tanker crew are eager to conclude a deal far sooner than that. On Thursday, Maersk, one of the world's biggest shipping firms, announced that some of its fleet, mainly tankers, would no longer use the Gulf of Aden unless there were more naval escorted convoys. Travelling around South Africa's Cape of Good Hope instead of taking a short cut via the Suez Canal, would add several weeks to average journey times and substantially increase the cost of goods for consumers.